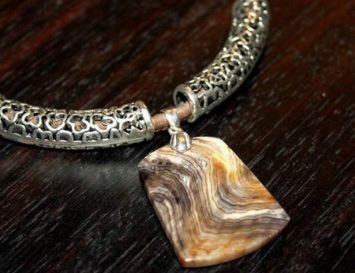 If you love jewelry and have high ethical standards, you may have a heck of a time finding stunning jewels that don’t hurt the earth and its people. Due to nasty mining practices and dirty politics, it’s pretty clear that even ‘certified’ diamonds can NOT be a girl’s best friend. Gold mining is one of the most polluting of the extractive industries’ activities. And some coloured gems, like emeralds and rubies, are just as bad as ‘blood diamonds’ since they’re often traded by corrupt regimes or drug traffickers for arms. 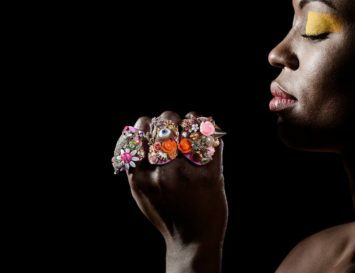 Sure, there’s a lot of creative and ethical costume jewelry out there, but what to do if it’s haute joaillerie that you’re after? Luckily, we’ve found 7 amazingly sustainable fine jewelry brands perfect for luxury lovers with a conscience, that also make great investment pieces that can be passed down through the generations. Arabel Lebrusan honours European history in her creations, since the expert hands of Spanish craftsmen forge her signature filigree patterns, some of which date back to the ancient Greeks. 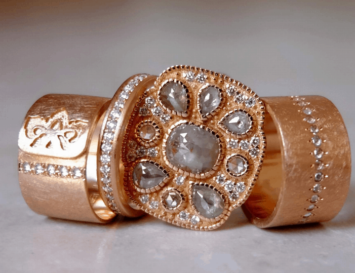 Using specialist hand engraving tools and with years of experience behind them, her artisans forge engagement rings, necklaces, bracelets and bangles using Fairtrade and Fairmined ecological gold, as well as Fair Trade, ethical gemstones. The beauty of her creations is fit for royalty – no wonder Queen Letizia was spotted wearing one of her jewels! 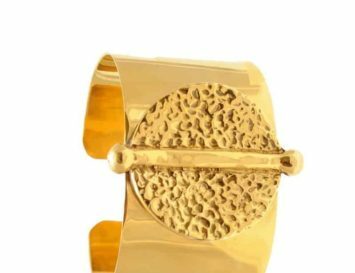 Jewellery to believe in is the concept behind this brand, which gathers the talents of British designers who create modern pieces that tribute our planet. Their silver is either recycled, or Fairtrade, in order to protect those workers who struggle to scrape a living from artisanal mining. As for female empowerment, you can rest assured that a Mosami purchase will aid women who are building businesses in developing countries. This sustainable jewellery brand stands as an emblem for clarity of the soul. 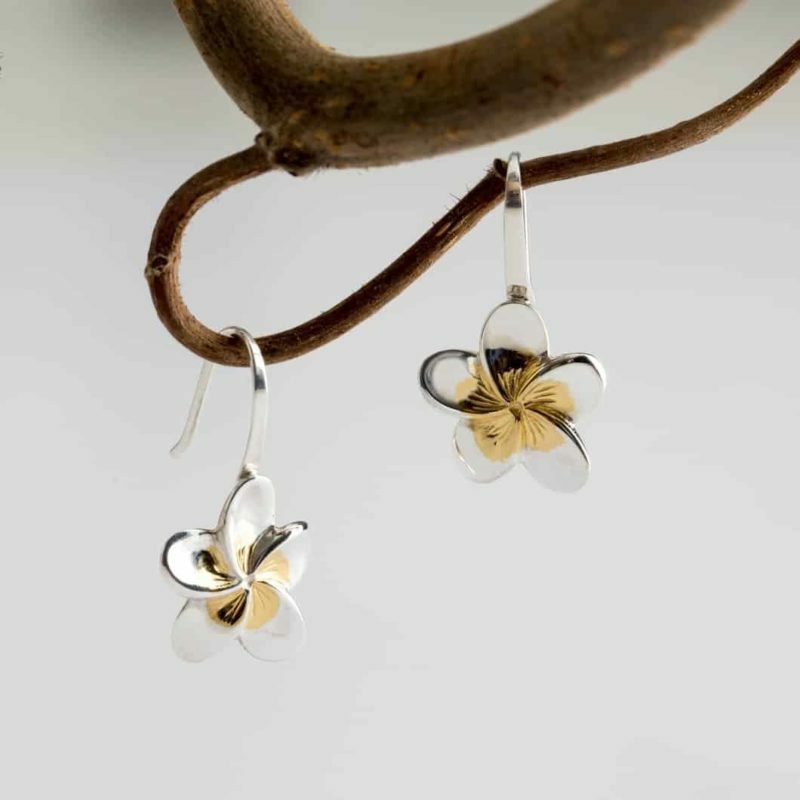 Elegantly designed, each piece is luxuriously crafted from ethically sourced materials such as recycled silver. Sacet is also aiming to become the first 100% carbon neutral jewellery-making workshop by installing solar panels to power a large portion of its workshop with solar energy. Furthermore, since more than 1.3 billion people in the world still live in extreme poverty, Sacet aims to change this by donating a percentage of profits back to Sacet’s craftspeople to improve their skills, healthcare and children’s education. Despite the Spanish name, Agua de Oro was born in the global centre of fine jewellery – Switzerland. 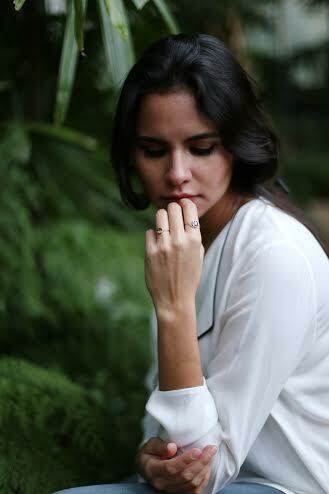 The brand offers Fair Trade gold and cultured diamonds delicately placed in a variety of settings and styles. 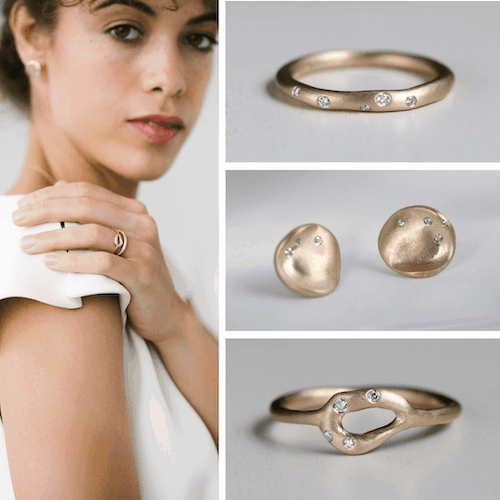 Agua de Oro specialises in classical but ethical engagement and wedding rings; their latest collection Oceane, however, is a fashionable tribute to Mother Nature with its simple and modern shapes, plus a percentage of each sale will be donated to ocean charities. 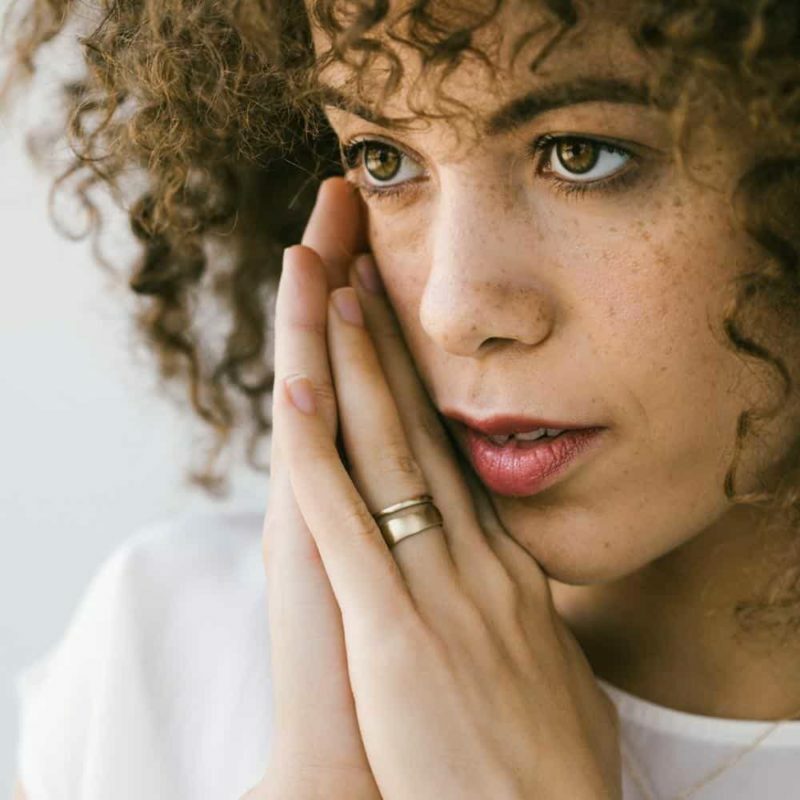 Seattle based brand Aide-Mémoire Jewelry have recently launched their Sculpted Collection, which fuses together reclaimed gold jewellery with lab-grown diamonds. Also called ‘synthetic diamonds’, these have a much smaller social and environmental footprint than mined diamonds. The Sculpted pieces include everything from dainty pendants to statement rings, and the brand fits nicely in the space between lavishly expensive jewelry and mass-produced costume accessories. Each item is made by hand and caters to those looking for ethically and environmentally sustainable jewellery that will last for years to come. Ethical jewellery designer Bliss Lau believes strongly that jewellery should be a physical experience, inspired by sensuality and structure. Bliss elegantly juxtaposes dichotomous relationships – bold and delicate, bound and free, organic and linear – and embraces the interplay between them to create both fluid and kinetic forms. Throughout the evolution of her career, she’s collaborated with several other talents, such as SeeMe, the jewellery brand. 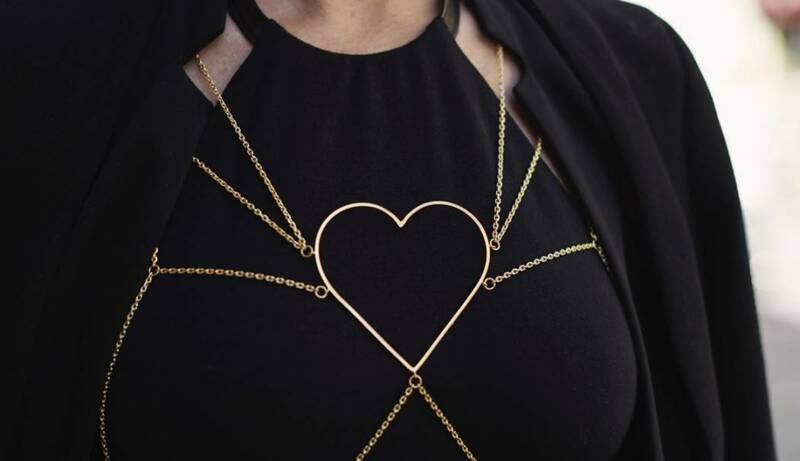 The resulting partnership produced gorgeous body chains, below, that completely transform everyday outfits into hyper chic fashion statements. Founders love pretty, shiny things, but hate environmental destruction and human exploitation, so they created a fine jewellery label called Lark & Berry that they knew would always be ethical – because they create the stones they use themselves – in a lab. 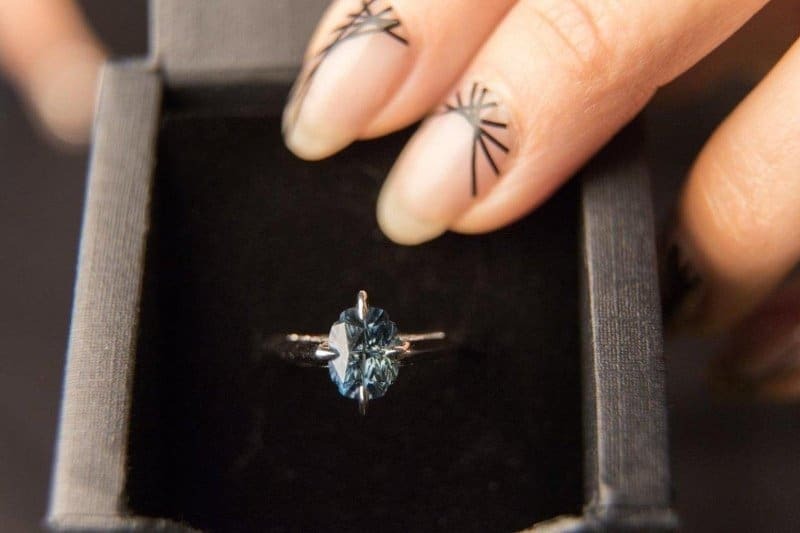 Their cultured diamonds have the exact same chemical structure of a mined diamond, and are created in the same way the earth creates the stones, through heat and pressure. Not even most trained experts can tell the difference – but you can rest assured lab-created diamonds are 100% conflict free.